April weather can be touch and go here in New England, sometimes kicking off with a snowstorm and winding down with spring buds. 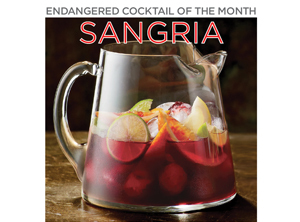 As our favorite bars start to throw open their windows and patio furniture creeps onto sidewalks, it seems these days like every watering hole from the corner pub to the high end cocktail bar is keen to show off their take on Sangria. But where did this all begin? Sangria, as it happens, is as old as wine. Throughout history civilizations have managed the problem of potable water by mixing a little alcohol in with whatever bubbles forth from the nearest brook, and managed the problem of inferior wine by mixing in herbs, honey, spices, and fruit. They were mixing something similar up in Spain as early as 11OO B.C. with wine from vines planted by Phoenicians, and later with grapes cultivated by the Romans. Red wine was commonly used, and the beverage took its name from “sangre”, the Spanish word for blood. In colonial America, our forebroads drank Sangaree, which was usually made of Madeira and popularly mentioned in travelers’ accounts of the Caribbean, where, as David Wondrich writes in Imbibe!, “Spaniard and Englishmen mixed with great frequency.” But, “by the Civil War, Sangaree was getting a little long in the tooth.” Sangria, on the other hand, made a huge splash stateside at the 1964 World’s Fair, where it was served at the Spanish pavilion. 55 years later and the U.S. has yet to slake its thirst. This traditional recipe comes from national bartending treasure, Portland, Oregon-based bartender and writer Jeffrey Morgenthaler. His blog and his books share so much wisdom, take a gander at the recipe below and make a toast to spring! MIX ingredients together in a large pitcher. SERVE in goblets over ice.